In the former Nizam's dominion, in Aurangabad district, there was a remote village called Pathri. In that village there lived a couple by name Gangabhavadya and Devagiriamma. They were grieving because they did not have any children. In answer to their prayers, a son was born to Devagiriamma on September 28th, 1835. That child was SAI BABA. 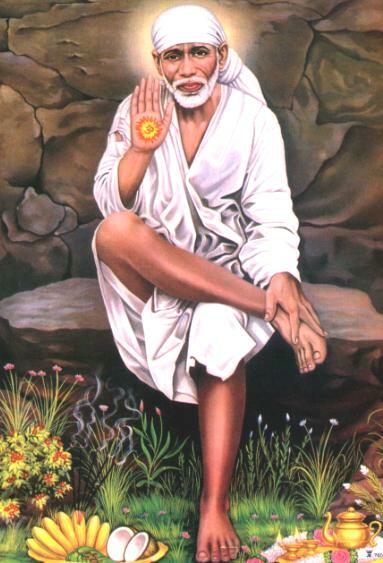 On account of the passage of time and circumstances, no one knew the exact dates of Baba's birth and passing. In this context, the mystery relating to Baba's birth should be noted. Gangabhavadya and Devagiriamma were living in Pathri village, they were ardent worshippers of Ishwara and Parvati. They had no offspring for a long time. They intensified their prayers. Gangabhavadya used to play a boat near the village for living. One night, when it was raining heavily, Gangabhavadya left his house to take care of the boat, telling his wife that he would not return that night. After the husband had left, Devagiriamma took her food and went to bed early. At 9 p.m. there was a knock at the door. Devagiriamma opened the door expecting the likely return of her husband. Instead, a very elderly man entered the house. He pleaded, "It is very cold outside. Please permit me, mother, to stay inside." Being a pious woman, Devagiriamma allowed him to stay in the verandah and went inside the house after bolting the inner door. A little while later, there was a knock on the inner door. She opened the door. The old man said: "I am feeling hungry, give me some food." Finding that there was no food, the woman mixed some flour with curds and gave it to him. There was again another knock after some time. When she opened the door, the old man said, "My legs are aching. Mother, will you massage them? " Devagiriamma went inside, sat in the prayer room and prayed: "Oh Mother! Why are you testing me like this? What should I do? Should I serve him or refuse? " Going out of the house by the back-door she went in search of someone who could be engaged to render this service. No one was available. Again there was a knock by the old man. At the same time a woman knocked at the backdoor. The woman asked, "It appears you came to my house and sought some feminine help. I was away at that time. Please let me know what service I should render." Feeling happy that Goddess Parvati herself had sent the woman in response to her prayers, Devagiriamma sent the newcomer to the verandah for serving the old man and closed the door. The old man and the woman who came to render help were none other than Parameswara and Parvati. Parameswara told Parvati "Fulfill the cherished desire of this lady." Parvati replied, "You are the Supreme one. Please shower your grace on her Yourself." Eswara said "I came to test her. You came in answer to her prayers. Hence You must bless her". They knocked the door once again. This time Devagiriamma promptly opened the door, because of the presence of another woman emboldened her. Parvati and Parameswara appeared before her in their Divine form. Unable to contain her joy, Devagiriamma fell at their feet. Parvati then blessed her: "I grant you a son to maintain the lineage and a daughter for Kanyadana (a girl to be offered in marriage)." Then Devagiriamma fell at the feet of Eswara. Eswara said: "I am immensely pleased with your devotion. I shall take birth as your third child." When Devagiriamma got up, the Divine couple were not there. Feeling, ecstatic over this experience, Devagiriamma was eagerly expecting the return of her husband in the morning to relate to him the whole story. The husband returned in the morning. Eagerly awaiting his arrival she related to him all that had happened the previous night. The husband said: "Devagiri! What is all this fanciful tale! It is all a dream. Parvati and Parameswara appearing before you and giving darshan! It is pure fantasy!" Gangabhavadya dismissed the whole episode as incredible and fanciful. But, as years passed, Devagiriamma became enceinte and a son was born. A year later a daughter was born. Gangabhavadya was convinced that the birth of the two children was the result of the blessings conferred by Parvati and Parameswara. He told his wife, "You had the good-fortune of having the darshan of Parvati and Parameswara. I did not have that luck." When Devagiriamma conceived again, Gangabhavadya began to feel an urge to give up hearth and home and go in search of the Divine couple. He announced to his wife that he was leaving for the forest to do penance. The devoted wife that she was, Devagiriamma decided to follow him, though she was in the ninth month of her pregnancy. After following her husband for some distance, she developed labour pains. She delivered a boy. Wrapping the babe in a piece of cloth, she left the child by the road side and followed her husband.